A board member of the largest US pension fund has written a scathing letter to its chief executive, criticising her for supporting private equity industry “propaganda”. Joseph Jelincic, a board member of Calpers, which helps finance the retirement plans of teachers and firefighters, has sent a damning letter to Anne Stausboll, the pension plan’s CEO. He questioned the competency of Calpers’ investment staff regarding its private equity holdings. A swath of US public pension plans, including Calpers, has come under growing pressure to provide accurate data on total private equity fee payments after failing to report how much has been paid in “carried interest”, or investment profits, to private equity managers. Questions about Calpers’ $30.5bn private equity portfolio arose again at a meeting on August 17. Mr Jelincic wrote the letter because of his dissatisfaction with the information provided at that meeting. “They are negotiating these [private equity] contract provisions on a daily basis but do not seem to understand the most basic aspects of their economics,” Mr Jelincic wrote. Calpers employees were perpetuating the mythology of private equity managers by telling the board the fund was “receiving a better deal [from its private equity managers] than we actually are”, Mr Jelincic said. “The role of Calpers staff is not to propagate [private equity managers’] propaganda but to guard against it,” he wrote. John Chiang, state treasurer of California, told FTfm in July he would demand clear answers from the $300bn pension plan regarding why it does not know how much has been paid in carried interest over a period of 25 years to the private equity managers running Calpers’ assets. A meeting has been arranged between Ms Stausboll, Ted Eliopoulos, the pension fund’s chief investment officer, and Mr Jelincic for mid-September. Yves Smith, a critic of the private equity industry on the Naked Capitalism website, said that the oversimplifications and mistakes made by Calpers’ management suggested it could not invest responsibly in private equity at all. US regulators have been urged to improve reporting standards on fees and expenses by a coalition of senior elected state officials, which includes Mr Chiang, who sits on the board of Calpers along with Mr Jelincic. Calpers has pledged to report total carried interest for the first time in the autumn. It made its first private equity investments in 1990 and employs more than 100 private equity managers. Calpers identified a need to track fees and carried interest better in 2011 but it has taken until now to develop a new reporting system. The Institutional Limited Partners Association, an industry group representing investors, last week launched an initiative to standardise the reporting of private equity fees. It's about time the Institutional Limited Partners Association (ILPA) launches an initiative on standardizing the reporting of private equity fees. Last week, the ILPA published a press release on its Fee Transparency Initiative, an effort to increase transparency in private equity. The story was picked up by major media outlets and was the focus of Private Equity International’s Friday Letter. The full press release and coverage from some of these outlets are provided on the ILPA's website here. Getting back to the article above, I completely agree with Joseph Jelincic: “The role of CalPERS staff is not to propagate [private equity managers’] propaganda but to guard against it.” It hardly surprises me that "CalPERS does not agree with his opinions" but as I stated in a recent comment of mine on CalPERS' fiduciaries breaching their duties, it's utterly unacceptable for any limited partner (pension fund, sovereign wealth fund, insurance company, endowment, etc) not to know the fees it's doling out to private equity funds. Because of the time I spend on the Board I do not participate in the IO III incentive program even through it is in the contract. (I estimate that costs me 10-15K a year.). So you can see I really don't have an economic conflict. Being on the Board has no impact (at least positively) on my income. It may make management uncomfortable but that is a different issue. BTW the Sacramento Bee has a database that shows the salaries and bonuses for all the Investment Officers." "JJ. Jelincic in my opinion is by far the most effective trustee on a US public pension plan ever. He was elected by State employees. My understanding is that he is on indefinite leave from his staff position at CALPERS, (but receives his full pay) to actually be a full time employee. The conflict issues were dealt with years ago. I fear you are getting misinformation from the PE industry who want to retaliate against him for exposing them." I don't know if the private equity industry is going after JJ Jelincic but he's definitely asking the right questions to CalPERS' senior investment staff and it's quite disconcerting to see the flimsy and evasive responses he's been getting from them thus far. In the last CalPERS Investment Committee meeting, one of the most revealing incidents took place when Investment Director Christine Gogan repeatedly refused to answer a simple, direct question about a widely-used private equity tax abuse, management fee waivers, from board member JJ Jelincic. This was pure and simple insubordination and reveals serious governance problems at CalPERS. This is also not the first time we’ve seen staff show disrespect for a board member, but it is one of the most flagrant incidents. Moreover, Gogan’s evasiveness suggests that she was not able to field a response, raising doubts about her ability to do her job. Finally, her misdirection served not simply to keep the board in the dark, but also conveyed inaccurate information to them. Board Member JJ Jelincic: Okay. I won’t ask about offsets. Fee waivers. Can you explain to me what fee waivers are, how they’re used, and how the GP gets their money back? Gogan: …correct? And so your question is, to start with, you’re trying to get a sense of throughout our portfolio how common that arrangement is? Jelincic: That’s a question that I had asked earlier. There’s some research apparently being done on it. But this question is just how does it work? What’s the process? What’s the economics of it? You know, quite frankly, I’m sure that the Wall Street hearts of private equity don’t say, you know, I overcharged you, I’m just not going to take the money. Gogan: Well, I think, if I could, one thing that I would like to back up and offer up is that with respect to our entire portfolio, it’s important to note that the entire portfolio is audited. Everything is audited. Ninety-seven and a half percent of the portfolio is audited under standards that conform with U.S. GAAP. And so one of the questions without going into a lot of detail on how the management fee waiver mechanics work from partnership to partnership, and it depends to Réal’s earlier point on the waterfall computation, one thing that does give us comfort with respect to having assurance that the bottom line numbers that we’re relying upon are fairly stated, is that the majority of the portfolio, as I mentioned, the overwhelming majority is prepared in accordance with U.S. GAAP. And there are independent auditors typically, one of the top three, that provide a statement to us that provide information that we, as investors, are reasonable in relying on the fact that the financial presentation of the income statement, the balance sheet, and the capital accounts are materially accurate and fairly represent the financial position of the company. Jelincic: And so how does the fee waiver function work? Gogan: And so with respect to the fee waivers, to some degree, it’s going to depend on whether it is a European waterfall or whether it is a deal-by-deal waterfall. But my point in trying to go back to the audited financial statements is that in accordance with presenting the financial condition of the individual partnership, there are independent auditors that look every year to evaluate and assure that the computation of net income is consistent with the particular limited partnership agreement, and take into account each of the idiosyncratic conditions of the various waterfalls that exist for that particular partnership. Jelincic: And the SEC would say they didn’t do a very good job of it. The staff responses are absurd. Ms. Gogan failed a basic test of her fiduciary responsibilities. She is required to provide information in a timely and practical manner and she did neither. The Committee’s questions were direct and clearly stated and her replies were evasive, perhaps even obtuse. Gogan’s repeated reliance on the audits for detail specificity is misplaced and is a “dodge.” GAAP audits are helpful but are not, as she implies, appropriate as the primary due diligence tool for PE fees, expenses and income. A sophisticated fund such as CalPERS has the ability and right to demand more stringent initial and on-going due diligence and the staff should be willing participants in that effort. Committee members should not be forced to “dance” with staff for information due them as a fiduciary. As ugly as this picture is, it’s actually worse than Loftis indicates. If you watch the committee meeting in full, you’ll see again and again that if a staff member looks to be having difficulty answering a question, someone rides in quickly to their rescue. Here, no one more senior spoke up. By contrast, recall our post last week where the CalPERS Chief Investment Officer, Ted Eliopoulos, described management fee waivers as beneficial to CalPERS when they are a tax dodge that does not benefit limited partners like CalPERS. Eliopoulos had spoken up because the Managing Investment Director responsible for private equity Réal Desrochers was struggling to come up with the proper term of art, management fee waiver, in response to a question from board member Priya Mathur (and yes, the fact that Eliopoulos had to intervene was not a good sign). Similarly, when Jelincic was trying to get answers from Desrochers about another common provision in private equity limited partnership agreements, management fee offsets, Desrochers kept saying he’d be happy to answer the questions later, which almost certainly also meant out of the public eye. When Jelincic pressed onward, the chairman of the Investment Committee called Jelincic out of order, then reversed himself when Jelincic appealed the ruling and asked for a roll call vote. Thus, as Gogan engaged in a heavy-handed form of obstructionism, no one intervened. By implication, her stonewalling of Jelincic had the full support of her boss, Réal Desrochers, and his superiors who were also present at the meeting, Eliopoulos and the Chief Operating Investment Officer, Wylie Tollette, as well as Mike Moy, CalPERS’ private equity consultant. In other words, staff and CalPERS’ outside advisors are apparently united in its position that the board is not entitled to honest and complete answers. As we discussed at length earlier this year, Tollette clearly and knowingly misdirected the board in trying tell them that it couldn’t get carried interest fees. And most of the members of the Investment Committee seem to back staff’s apparently successful effort to tell board members as little as possible. You’ll notice that the chairman of the Investment Committee, Henry Jones, never once supported Jelincic’s efforts to pry information loose from the private equity team. Instead, he consistently weighed in on behalf of staff to uphold their apparent right to be less than forthcoming. Gogan completely dodges the question, talking about financial statement audits and European versus deal-by-deal waterfalls. I can’t see any relevance at all of this to Jelincic’s questions. There are two potential explanations for the dodging: she doesn’t actually know at all how fee waivers work or she’s defensive about where Jelincic is going with his questioning. I’d vote for the ignorance explanation for two reasons: (1) someone who knows the basics of fee waivers could have dodged whatever questions were coming without coming off as clueless (she could have fended off any criticism simply by noting that fee waivers can’t hurt CalPERS and she could have pointed out that, in any event, fee waivers are pervasive in the industry and the CalPERS lawyers thought fee waivers were fine at least until the recent guidance which requires them to take a fresh look); and (2) relatedly, there is no reason for someone well-versed in the basics of fee waivers to be all that defensive about them (at least from the LPs perspective). It’s a tax game between the GPs and the IRS; the LPs are really just bystanders. Bottom line is that I think the exchange suggests that Gogan doesn’t know much about fee waivers. It’s like when I ask a law student in my class about something that he or she knows very little about even though they should know it. They change the topic to something they know about, even if it has little relevant to the topic at hand. Actually, there could be a reason for Gogan to refer to waterfalls, but that would simply confirm that she indeed does not understand how management fee waivers work. The “distribution waterfall” determines how to divvy up the proceeds of the sale of a company between the general partner and the limited partners. By focusing on the distribution of funds in the event of a sale, Gogan is cementing the misinformation that Eliopoulos also conveyed to board members in the same meeting, namely, that the management fees that the general partners forego are put at risk on the same footing as the monies provided by the investors. Earth to board members: they aren’t. As we discussed at length in a post last week, the general partners have the ability to gin up profits for purposes of recovering their waived management fees, including creating them even when there have been no sales of assets in the fund at all. So take your pick. Gogan is either trying to cover for the fact that she is out of her depth or is choosing to mislead the board by doubling down on the false story that management fee waivers are a plus for CalPERS because they aligning the interests of the general partners with those of the limited partners. Board Member Dana Hollinger: In the past have we seen the financials of those underlying companies or no? Chief Investment Officer Ted Eliopoulos: Well, I’ll turn that question over to Christine. Gogan: With respect to what’s been occurring in the industry is there’s definitely been an evolution that’s occurred over time. And I would say we are moving towards an environment where we are receiving the much more detailed information with respect to the underlying. But to make a broad statement that we have always had access to the underlying detailed information in the portfolio companies is a stretch. It’s definitely improving. Public pension plans should not accept as gospel the paltry representations from the GP as to the condition of the underlying investments, valuations and their attendant risk. The failure to perform the required due diligence and adequate ongoing oversight are unforgivable errors that will cost the fund substantial sums of money. And that’s before you get to the fact, as we discussed in depth in a 2013 post, Why You Should Not Trust the Financials of Private Equity Owned Companies, that many general partners use a portfolio company software package called iLevel Solutions, which gives private equity general partners an unprecedented ability to cook the books of their portfolio companies while maintaining a facade of compliance. In other words, the portfolio company data that CalPERS does get is of questionable integrity. 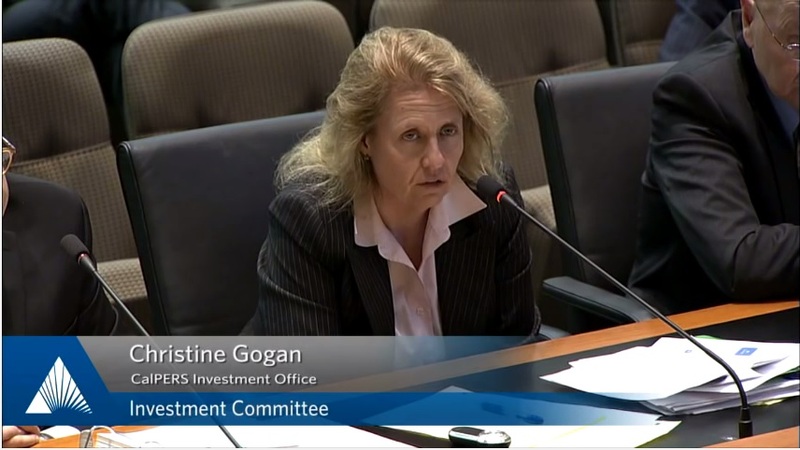 Gogan’s stonewalling shows the true face of CalPERS’ private equity staff: that they deem it to be acceptable to defy and mislead the board to protect private equity general partners. This warped sense of loyalties is proof of serious governance problems at CalPERS. But the sorry fact is that the board itself, save JJ Jelincic, has made clear by its failure to press for better answers that it fully supports this abject failure of governance and neglect of fiduciary duty. The IRS is seeking to limit private-equity executives’ practice of reducing their tax bills by reclassifying how their management fees are taxed. Rules proposed by the agency on Wednesday would make it harder for firms to convert high-taxed fees into lower-taxed carried interest, and by doing so take advantage of a 19.6 percentage-point difference in top tax rates. The proposal represents one of the U.S. government’s most concrete attempts to limit the tax benefits enjoyed by private-equity managers. The “modest move” by the Internal Revenue Service would stop some of the most abusive maneuvers by private-equity firms, said Victor Fleischer, a tax law professor at the University of San Diego. “The regulations strike me as more taxpayer-favorable than I would have expected,” he said. “The regulations try to accommodate some arrangements that are common in the industry and that in my view ought to be treated as payments for services,” and taxed as ordinary income. President Barack Obama wants to tax carried interest as ordinary income at rates as high as 43.4 percent instead of as capital gains at rates up to 23.8 percent. That effort fell short when Democrats controlled Congress and isn’t going anywhere with Republicans in charge of both chambers. Typically, private-equity firms charge their investors a 2 percent fee on their assets and also keep 20 percent of profits, known as carried interest. By using waivers, firms can forgo some of their fees and take a bigger share of the profits -- along with the tax benefit of doing so. The rules, aimed at preventing “disguised payments for services,” say each case should be decided on the specific facts at hand, with weight given to whether fund managers bear a risk of losing money. The Private Equity Growth Capital Council, an industry trade group whose members include the Carlyle Group, Silver Lake and TPG Capital, said it was still studying the proposal. “It is important to remember that management fee waivers are and will remain legal, widely recognized, and part of negotiated agreements between the alternative investment community and investors, including pension funds and endowments,” Steve Judge, the group’s president and chief executive officer, said in a statement. Private equity executives sometimes swap their cut of management fees into investments as a way to satisfy capital pledges they have made to funds managed by their firms. The strategy surfaced as an issue in Mitt Romney’s 2012 presidential campaign, when documents from Bain Capital, which he co-founded and led, showed Bain used it to shave partners’ taxes by more than $200 million. Apollo Global Management, another prominent firm, offered waivers to its partners until 2012, it said in a regulatory filing. Blackstone Group, the world’s largest private equity manager, and Carlyle have said they avoid the practice. Fleischer said he was surprised at one example in the rules: fund managers were deemed to have enough at risk when they choose whether to reclassify their fees as few as 60 days before a tax year starts. By that time, future profits may be relatively certain. “At the point where the general partner is making the decision whether to waive the fee,” he said, “they’re in a very good position” to know how successful the investments will be and can control the timing of realized gains and losses. There are differing opinions on the new regulations aimed to stop private equity managers from converting fee income to capital gains and the IRS is still studying this proposal and invited public comments. I personally think these proposed regulations make sense. Also notice how Blackstone and Carlyle, the two giants in the industry, avoid the practice, so why can't others follow them? Below, I embedded part 1 & 2 of the CalPERS Investment Committee from August 17th, 2015 (discussion on PE begins at minute 50 of second clip). Take the time to watch these clips as this isn't just a CalPERS issue, it's an issue impacting many other large pension funds that invest in private equity.